This paper addresses the link between productivity and labour mobility. The hypothesis tested in the paper is that technology is transmitted across industries through the movement of skilled workers embodying human capital. The embodied knowledge is then diffused within the new environment creating spillovers and leading to productivity improvements. A theoretical framework is presented wherein productivity growth is modelled through knowledge acquisition with respect to labour mobility. The empirical estimates confirm the existence of positive cross-sectoral knowledge spillovers and indicate that labour mobility has beneficial effects on industry productivity. 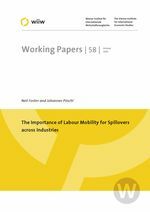 Due to the fact that labour mobility is closely linked to input-output relations this finding provides evidence suggesting that part of the estimated productivity effects of domestic rent spillovers are in fact due to knowledge spillovers resulting from labour mobility.